We first noticed this banner at the Birds Nest roundabout on Sunday 28th January, but it was apparently one of five that went up around Deptford on Friday evening. 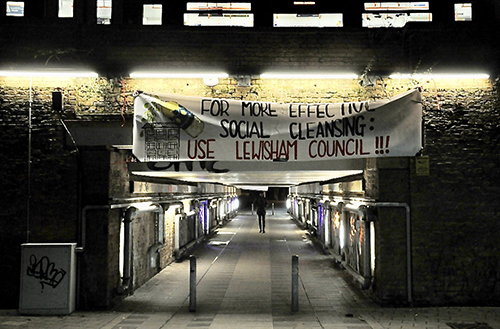 Protesters were trying to highlight the plight of Council tenants whose homes (and businesses) are due for demolition to make way for new developments planned by Lewisham Council. Publicly owned green space (Tidemill Old Wildlife Garden) will also be lost. The Council defends its policy of demolition on the basis that more social housing can be built in its place as a result of it partnering with private developers who will of course build even more private housing as well. 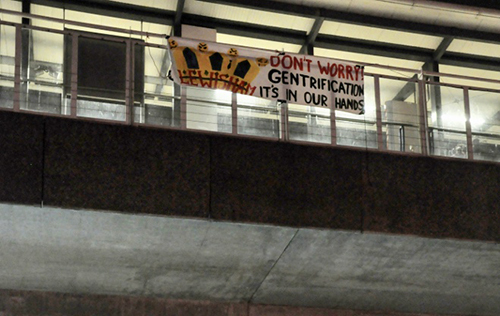 Never mind that the tenants themselves do not want their homes demolished. Such deals are common across London Labour boroughs, the most controversial being the Heygate and Aylesbury estate regenerations in Southwark where very little social if any housing has been achieved and so many people have been displaced. The most recent controversy is the Haringey Development Vehicle (HDV) which has resulted in the leader of Haringey Labour resigning after Councillors who supported the plan to go 50/50 with Lend Lease were voted out in local elections to be replaced with new Councillors who opposed the plan. We've covered the Tidemill and Reginald Road story quite a lot on this blog, the last post being an overdue report in November on the September planning decision, surely one of the most undemocratic planning meetings in the present administration's history. We also caught up in November with what is going on at Achilles Street in New Cross – just the other side of the underpass. Tenants and leaseholders as well as businesses are fighting to save their homes, shops and restaurants, while the Council drags its heels on its plans – without giving any indication that they will change them in any way. As with Tidemill (where the publicly funded subsidy for the affordable housing was not secured till the very last minute) such delays are usually due to the Council finding suitable development partners. Fortunately, another writer is keeping us to date with what is going on at Reginald Road and Achilles Street. 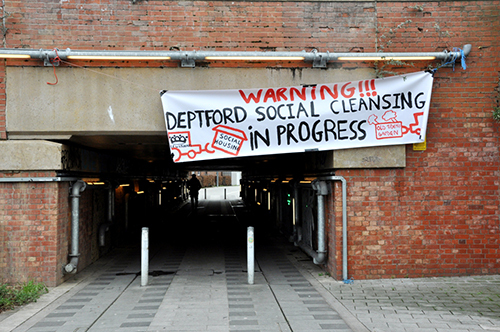 PHD student Anita Strasser has just posted on her blog Deptford Is Changing. She notes how tenants' mental health is affected when they have no control over their own futures, and how (often family-run) shops and businesses risk losing their livelihoods. The Council refuses to ballot those affected. The banners remind us of how difficult it is for ordinary people's voices to be heard. A recent YouGov poll found that 71% feel they have no control over the important decisions that affect their neighbourhood and local community. 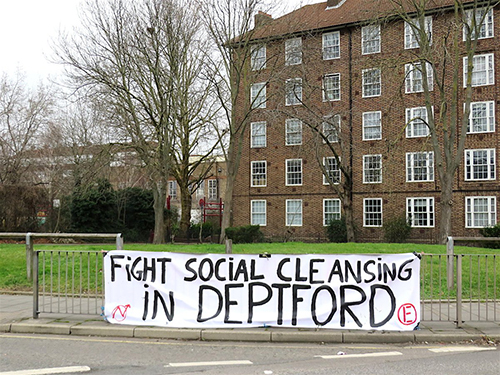 The campaign to bring back the Deptford Anchor is being hailed by some as a triumph of "People Power", but people's lives were not affected or put on hold while the Council took almost five years to capitulate to the campaigner's wishes. Reginald Road tenants have been living in limbo for almost ten years since regeneration plans for Tidemill were first mooted. Tenants and businesses affected by threats of demolition cannot afford the luxury of waiting so long to find out their fate. We haven't written about the Deptford Anchor since 2013 when a campaign began soon after it was removed. 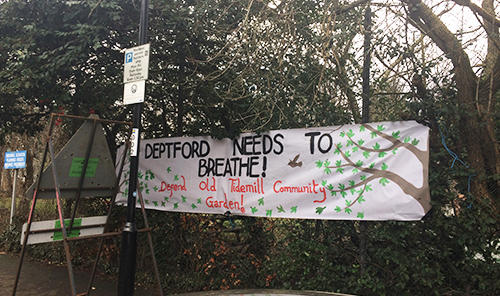 A petition was launched in late 2015 by the Deptford Society, which we linked to in our sidebar – but without any help from us the petition attracted hundreds of signatures within a few months. Another week has gone by since this pic was taken – the installation of a plaque is awaited before the fencing around the site can be removed. Meanwhile, there are two exhibitions about the anchor in Deptford Does Art at 28 Deptford High Street, close to the anchor site. On the ground floor Deptford Is Forever are showing a 'visual campaign archive', which reveal their links with local community initiatives The Lenox Project and Sayes Court. Both those projects grew out of a previous campaign by Deptford Is to get the massive legacy of the historic Deptford Dockyard recognised in the plans for Convoys Wharf by site owners Hutchison Whampoa – a campaign which this blog covered extensively in 2013 and up until the developer got planning permission from the Mayor of London in 2014. In the downstairs gallery at Deptford Does Art is the final year show of (now graduated) MA Landscape Architect student Max Barnes, who was inspired to make work about the Deptford Anchor by visiting tutors at Greenwich University, Bob Bagley & Roo Angel – the founders of Sayes Court. Barnes imagines the anchor being dragged from its storage place on Convoys Wharf back to the high street, gouging out the tarmac as it goes to create a fantastical new environment. The show closes on Sunday 4th Feb so catch it while you can. There are also two talks this weekend in the basement gallery where Barnes has created the context for a new take on the redevelopment of Convoys Wharf, aka Deptford Dockyard. • Saturday 4th at 3pm, Sayes Court. From what we can glean on the Deptford Is Forever website, various 'artistic' street interventions over the years helped publicise the petition till it reached over 4,000 in November 2016. Deptford Is Forever seem to be the naughty artistic wing of an otherwise respectable Deptford Society. But it seems the Council had started to take notice when the petition hit around 3,300. At least that's the figure mentioned in the Feasibility Study they saw fit to commission a few months after the petition had already hit that figure. We also note that the campaigners seemed to spend most of 2017 in delayed and protracted talks with the Council, because although the Mayor had agreed the anchor could return, the Deputy Mayor was very averse to it being installed in a position where it could actually be seen. A little bird tells us Cllr Alan Smith, who now seems to have quite a reputation for exaggerated and ill-founded expertise, also claimed it wasn't even a real anchor, and that the entire area was full of high power cables just waiting to explode on touch. It seems he expounded these fears on the basis that his wife once worked for UK Power Networks (and not because his own administration had a proper and authoritative conversation with the utility operator in question). But all that is by-the-by now, as last week our bit of ol' iron was finally brought back and re-installed on a generous bed of cobbles – seemingly a bigger area than the visuals shown in the planning submission of July/August 2017. The old anchor (thought to originate in part from the 1860s) has been thoroughly cleaned up and the chain has been welded together, presumably for health and safety reasons. 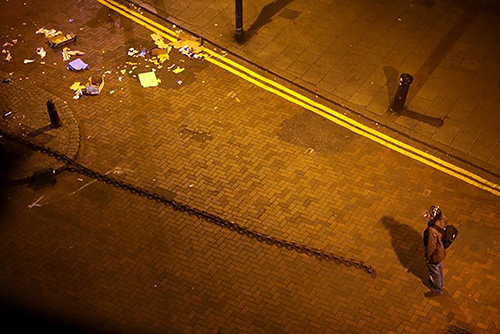 It can no longer be dragged out into the street by a passionately inebriated person as Ben Graville's pic shows here. There is no longer a plinth for the public to sit on, but it seems the campaigners acknowledged that the plinth could not be returned. The anchor was removed because of the anti-social behaviour of the street drinkers who congregated there in the latter days of its previous existence, so the Council were unlikely to allow it to happen again. 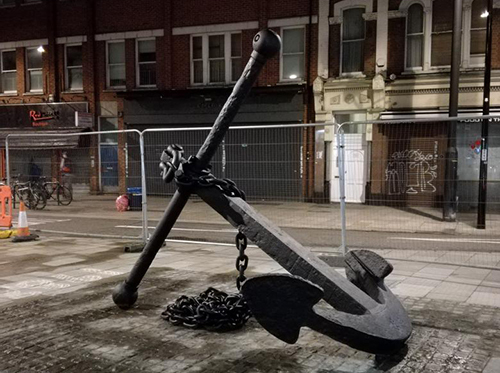 Meanwhile, 28 Deptford High Street is a Council-owned building that was originally part of the regeneration plans that saw the anchor removed in 2013, so it seems fitting that the anchor campaigners have found a temporary home there at the same time as the anchor returns. Deptford Does Art, who have been placing local artists' work in pubs and other venues in the area for a couple of years, fulfilled Lewisham's brief to provide a commercially viable community hub at No.28 DHS, but they weren't the first winners. Several groups applied, including a consortium of local community projects and activists headed up by the Deptford People Project (who have been providing free food to the homeless for some years). No one actually knows who won, but whoever they were, they pulled out, and Deptford Does Art were consequently invited to take on the premises, and do the best they could with a draconian lease, hardly any discount in rent or business rates, as well as no kitchen and no disabled access! They offer craft beers, wine, coffee and speciality teas, as well as vegan cakes and savoury bites, and are open Wed-Sun, 12-10.30pm. Local artists are queuing up to show their work. Deptford Does Arts's rosta of artists is unlikely to include the kind of contemporary artist who used to show at Hales Gallery and Cafe, which older residents will remember with fondness, as the cafe had such a beautiful back garden; such lovely outdoor spaces are in limited supply both then and now. The gallery downstairs put on shows that Charles Saatchi was known to visit and buy from. Who can remember when Hales Gallery got too successful for Deptford? For some landlords on the high street, the continual promise of gentrification wasn't happening soon enough. Hales Gallery, for instance, needed to capitalise on the interest they had in the artists they represented and were desperate to be in a more fashionable location (and a larger space) to continue their ambitions in the international art market. Hales Gallery moved to Shoreditch in 2004. They were not only ahead of the game, they had also benefitted from all the public funds going into the area. As a member of Shaftesbury Christian Centre (aka Bear Church), Hales owner Paul Maslin took advantage of grants and charity exemptions. Then he sold No.30 to Jennings the bookmaker who immediately sold it on to Corals, which precipitated a free-for-all for bookies wanting to take over the high street and a campaign we ran in 2011 against Betfred. Paul Maslin is one three Councillors for New Cross Ward (covering the area in question).